Bengali sweets are a big welcome to my taste buds. They are so tasty and wonderful. I'm very very choosy when it comes to enjoying sweets, as I don't have a sweet tooth. I enjoy anything spicy. But these wonderful treats are on my favorite list always. 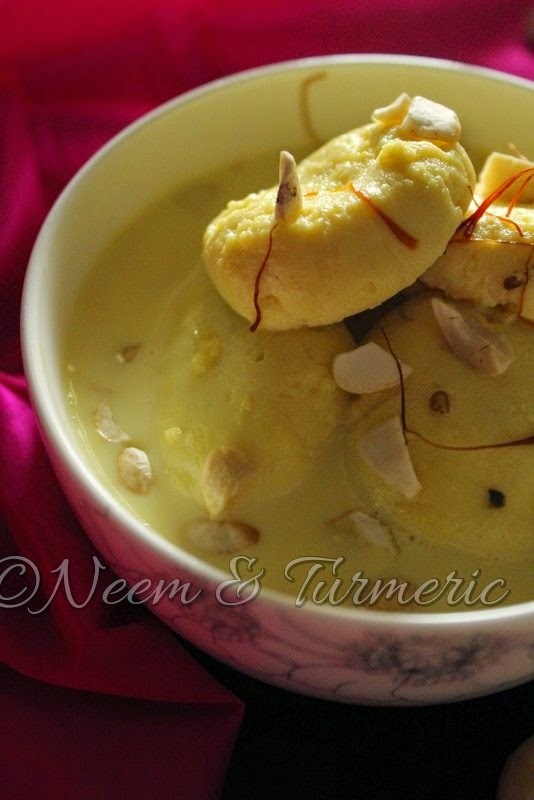 I can hog on millions of Rasmalai's anytime of the day. 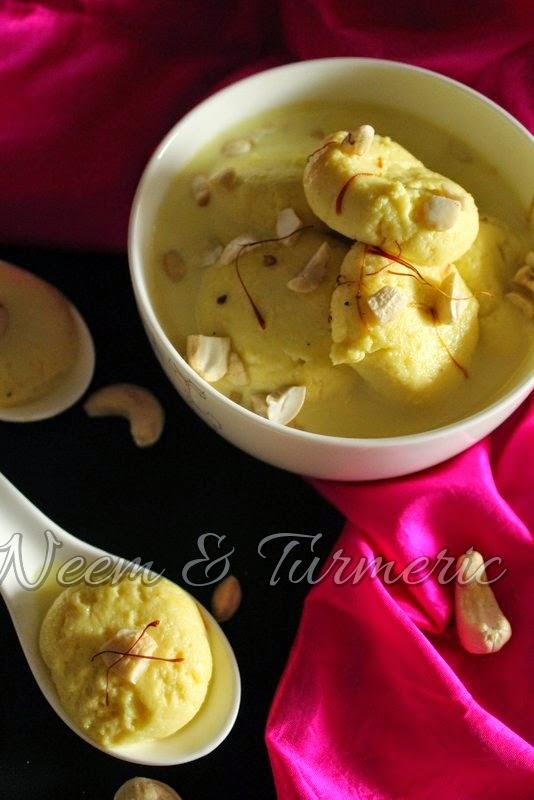 Rasmalai is made from Rasgulla. 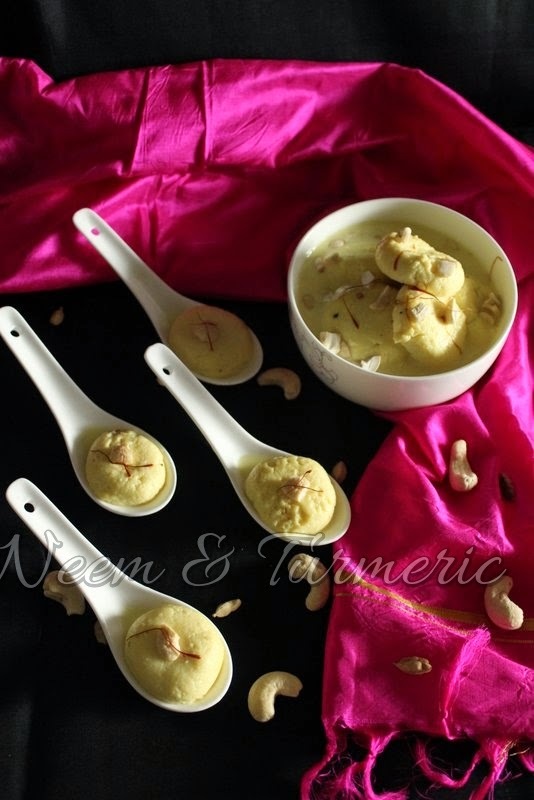 The only addition is the flavored milk instead of the sugar syrup used for the rasgulla. My friend Garima is the best in making Rasgulla. She is crowned as the Rasgulla Queen in one the foodie groups which I'm also a part. I took her recipe and the recipe from my favorite blog www.sharmispassion.com. The only difference I made was the number of cups of water used to cook the rasgulla. Instead of 5 cups, I used just 3 cups of water to cook the Rasgullas. Also, usually I use lemon juice to curdle the milk. But this time I used curd and the paneer was not smelling of lemon and no rinsing was required. The result, I was jumping joyously at the outcome. The Rasgullas were spongy, soft and melt in the mouth kind. Now lets get on to the recipe. Bring the milk to a boil. Add the curd or lemon juice and let it curdle. The milk mass and the whey should separate. Now, use a muslin cloth (mul mul cloth). Filter the milk mass from the whey. Squeeze out a little and knot it on top. Let it hang for 30 minutes exact and not more than that. The resulting paneer would be crumbly in nature. Now start kneading the paneer with the heel of your palm. As you knead the paneer, fat is produced and the paneer would form a ball like pliable dough. Make small small roundels and press them flat. Keep aside. Boil 3 cups of water with 1 cup of sugar. Bring this to a rolling boil and slowly add the paneer discs to this water. Let the discs cook for about 12 - 15 minutes. The discs should have enough space because they will double up in size. Once done, take one of the discs and put them in a glass of water. If they sink immediately, they are thoroughly cooked. If not cook them in the boiling water for another 5 minutes. Once done, add the rasgullas to clean drinking water. In a heavy bottomed pan, add 1/2 litre of milk. Bring it to a boil, add sugar, saffron strand let it reduce. It should not be too thick not too thin. Finally add cardamom and mixed dry fruits. 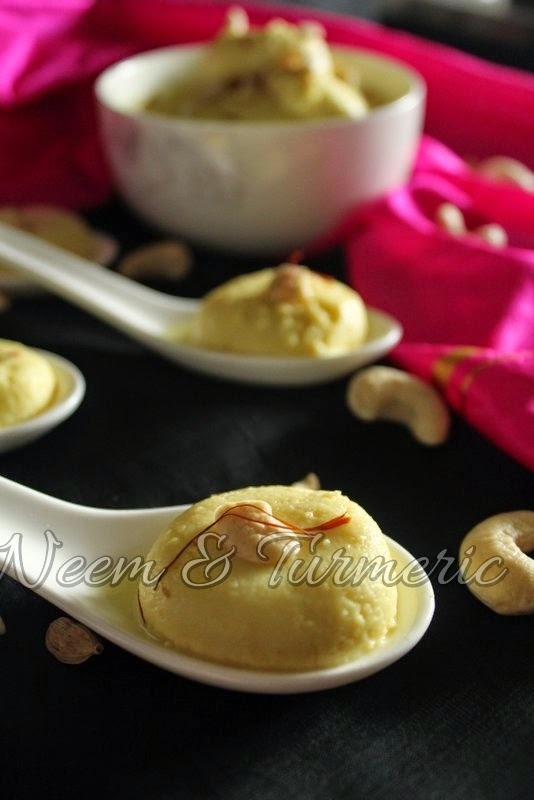 Gently squeeze the rasgullas and add them to the flavored milk. Let them boil together in the milk for atleast 15 minutes. Let it cool completely and serve cold.